NEW DELHI: Air pollution caused by burning of stubble in northern India causes an estimated economic loss of $30 b annually. Researchers from the US-based International Food Policy Research Institute (IFPRI) found that the air pollution caused acute respiratory infection (ARI). The study focused on the health and economic costs of crop residue burning (CRB). "Poor air quality is a recognised global public health epidemic, with levels of airborne particulate matter in Delhi spiking to 20 times the World Health Organization's safety threshold during certain days," said the report. "Among other factors, smoke from the burning of agricultural crop residue by farmers in Haryana and Punjab especially contributes to Delhi's poor air, increasing the risk of ARI three-fold for those living in districts with intense crop burning," it said. The study collected data of 250,000 individuals from Punjab, Haryana and Delhi. It used NASA satellite facilities. "Severe air pollution during winter months in northern India has led to a public health emergency. Crop burning will add to pollution and increase healthcare costs over time if immediate steps are not taken to reverse the situation," report said. The health problems created by pollution lowered the productivity of residents. 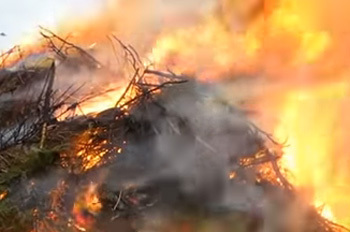 The study noted that crop burning is a widespread global practice.